More than 20 percent of the nation’s population — or 1 in 5 Americans — have a disability, and this number will increase as baby boomers age, according to a new report by the U.S. Center for Disease Control and Prevention. 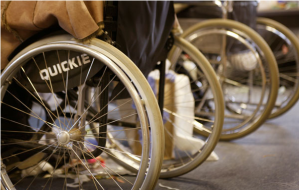 The number of Americans with a disability rose 7.7 percent, or by 3.4 million people, to 47.5 million between 1999 and 2005, said the CDC in its weekly Morbidity and Mortality Weekly Report. The aging of the population, particularly the baby boomers who were born during 1946 to 1964, has significantly contributed to the increase in disability rates. The three most common causes of disability continued to be arthritis or rheumatism, which affects 8.6 million people, followed by back or spine problems, reported by 7.6 million Americans. The third cause, heart trouble, was reported by 3 million Americans. Women had a significantly higher prevalence of disability compared with men at all ages. The CDC also found that the number of people reporting a disability doubled for each successive age group, with about 11 percent of people ages 18 to 44 reporting a disability; 23.9 percent for ages 45 to 64; and 51.8 percent for ages 65 or older. “The number of adults reporting a disability likely will increase, along with the need for appropriate medical and public health services, as more persons enter the highest risk age group,” Dr. Chad Helmick, of the U.S. Centers for Disease Control and Prevention, wrote in the report. The CDC used recent U.S. Census Bureau data to compile its findings. However, these figures are likely conservative. For instance, the Center for Hearing and Communications (formerly The League for the Hard of Hearing) says 31 million Americans have a significant hearing loss vs. the 1.9 million reported in the CDC’s findings. Likewise, the American Foundation for the Blind believes there are more than 20 million Americans experiencing significant vision loss, vs. 1.9 million reported by the CDC. In 2007, there were approximately 1.7 million persons living with limb loss in the U.S., according to the Amputee Coalition, compared to 209,000 in the CDC analysis. Another point to consider: The 1.3 million soldiers serving in the U.S. in Iraq and Afghanistan. Of the many weapons used against American soldiers, the most common are improvised explosive devices (IEDs), which can destroy limbs, hearing and sight. For example, nearly 70,000 of the troops who have served in the two war zones are collecting disability for tinnitus, a potentially debilitating ringing in the ears, and more than 58,000 are on disability for hearing loss, the Department of Veterans Affairs said. Separately, nearly 14,000 U.S. service members have reported post-traumatic stress disorder. SOURCE: U.S. Census Bureau, Survey of Income and Program Participation, 2004 Panel, Wave 5, June–September 2005.